There’s a blank wall on the side of a building in Scottsdale that could, pending an ongoing Kickstarter campaign, soon be covered with a mural dedicated to Sen. John McCain. The so-called "Maverick Mural" is just one way that some Arizonans are showing respect and admiration for the six-term senator. But the Republican icon and the state's other sitting senator, Jeff Flake, essentially have become persona non grata in the state’s upcoming primary. Flake’s announcement that he would not be seeking re-election this year has led to a field of three Republicans trying to replace him, each vying to appear more conservative than the rest. This crop of conservatives aligning themselves as much as possible to President Donald Trump shows a change in stance from the two Republican sitting Arizona senators who've both publicly rebuked Trump. 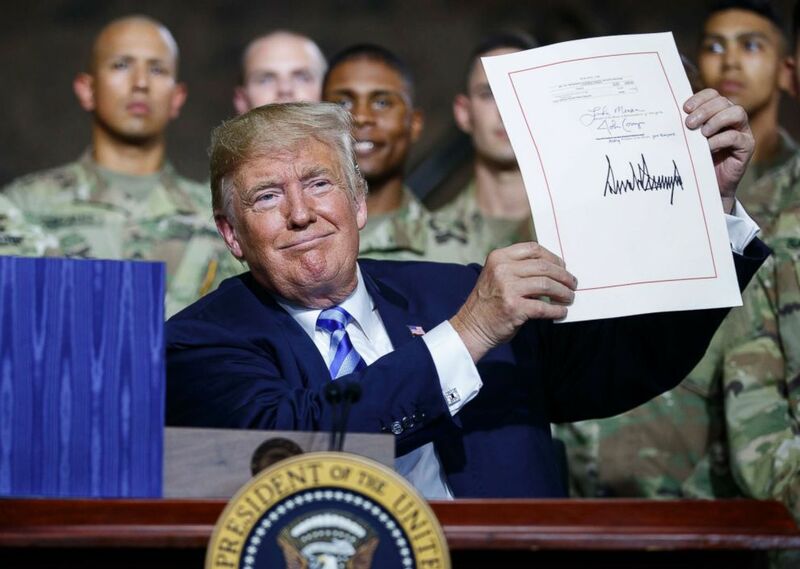 President Donald Trump during a signing ceremony for a $716 billion defense policy bill named for Sen. John McCain, Aug. 13, 2018, in Fort Drum, N.Y.
"There has been a shift," said Michael Burke, the chairman of Arizona's Pinal County Republican Committee. "Sen. McCain, you know, won a victory as late as 2016 -- he’s been elected by Arizonans for many years," Burke said. "Sen. McCain and the president, from the time he was a candidate, had differences, didn’t see eye to eye on things, and of course that came to a head when Sen. McCain voted against repealing the Obamacare laws." Rep. Martha McSally, former State Senator Kelli Ward and former Sheriff Joe Arpaio are all battling it out to win the state's Republican primary on Tuesday Aug. 28. They’ve all been touting their ties to and support of Trump and his administration. 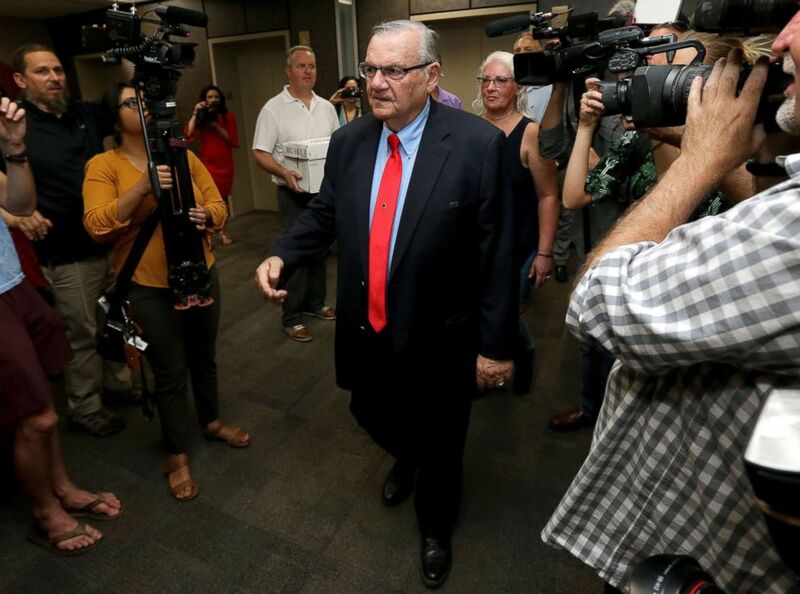 Former Arizona Sheriff Joe Arpaio arrives at the Arizona Secretary of State's office in Phoenix, to turn in petition signatures in his bid to appear on the ballot in the race to succeed retiring U.S. Sen. Jeff Flake, May 22, 2018. "I'm sure each one would very much welcome an endorsement from the president," Burke said. Ward got a presidential tweet of support in mid-August 2017, before the other two declared their candidacies. Arpaio campaigned with Trump in the 2016 race and received a pardon from him last in late August 2017. Most recently, McSally got a shoutout from Trump at an event where he signed the Defense Authorization Act -- the full title of which is the John S. McCain National Defense Authorization Act for Fiscal Year 2019 -- but neither Trump nor McSally mentioned the senator at the event. Republican Senate candidate for Arizona Kelli Ward attends CPAC 2018, Feb. 22, 2018, in National Harbor, Maryland. Richard Herrera, a professor at Arizona State University's School of Politics and Global Studies, said McCain "has had a tremendous influence in Arizona and Arizona politics ... [but] that has changed, and he's no longer seen by up and coming or emerging candidates running for office in the Republican Party as the endorsement that you want." McCain and Flake's regular criticism of the president's policies has been a consistent talking point for the three candidates vying to replace Flake, and, according to Burke, stands in contrast to the feelings of some Republican voters in Arizona. "Even though they had very much supported Sen. McCain in the past they were and are very disappointed with Sen. McCain in recent months. That Obamacare vote solidified that for them," Burke told ABC News, referencing McCain's vote against the so-called "skinny repeal" of the Affordable Care Act in July 2017. The same is true for Flake, Burke said. "He also is a constant critic of the president, and since the people in Pinal County are so very much in favor of the president, he fell out of favor to the point that even throughout the state his poll numbers were so low that I supposed that was a major reason why he decided not to run again," Burke said. "I think he realized that he did not have the support of not just the people of Arizona but the people of the Arizona Republican Party." Herrera said he believes part of Flake's decision not to seek re-election came from an analysis of the Republican base after Trump won the state in 2016. "I think he calculated that the base of Republican voters who were now activated as a result of the Trump win were different than the base of activated voters prior to that," Herrera said. That shift in which voters are "activated" and enthused about the Republican candidates for Senate means that others -- likely those who would have supported McCain or Flake -- may be inclined to stay home on Tuesday. "The voters who are going to be taking part in the Republican Party are more likely to be activated by President Trump than previous groups of republican voters," Herrera said, noting that with this crop of Senate candidates, "there's not much they [McCain or Flake supporters] can do so they probably will sit this one out in terms of the primary election." For Democrats like Drew Anderson, spokesperson for the Arizona State Democratic Party, the shift could mean either lower turnout among more moderate Republicans who would have supported a candidate like Flake or McCain, or some unexpected support. "I think what you're going to see is that a hefty amount of those voters will either not show up, or, for the first time in their life, vote for someone other than a Republican candidate," Anderson told ABC News.